If you're into Apple but you're not willing to wait for the next iPhone, why not try out the new outlet store and see if you can grab a 5S for chip-cheap prices. 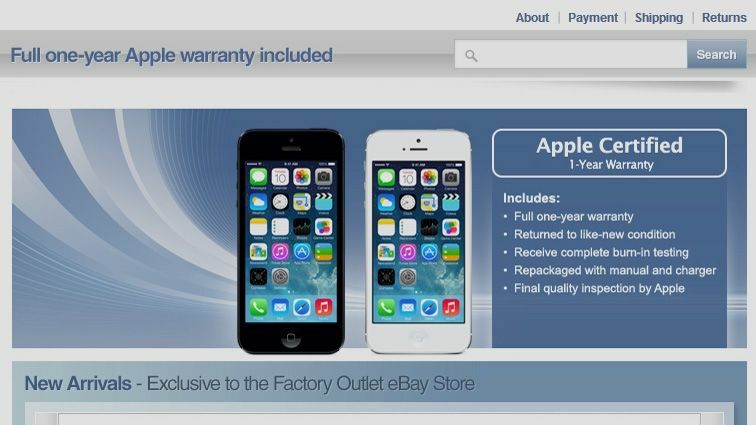 An Apple outlet store has opened on eBay flogging used 'factory-certified' iPhones at incredibly low prices. The refurbished devices come with a host of perks you won't find with a bog-standard second-hand blower anywhere else on eBay. Bonus features include a full one-year warranty, a refurb to 'new-like condition', complete burn-in testing, repackaging with manual and charger, and a full and final Apple quality inspection. The site seems has already sold around half a dozen iPhone 5S's, for a mark-up of around $500 - that's about £290 sterling. Considering the iPhone 5S sells here new for around £550, we'd say that's an unmissable bargain. Unfortunately, the store is only accessible on US eBay and, while this doesn't mean you can't buy one from here in the UK, you will have to pay shipping costs if you want to drag the phone across the atlantic. Check out the Apple outlet store here, and let us know what you think of the bargain deals in the comments.